There is an energy to New York that is unlike any other city in the world, there is a sense of urgency, hope and sharp directness. We nestled into our small Air BnB room in a six floor walk‐up on a bustling street in Chelsea and armed with a list of “to‐do’s” we set out for our adventure in this big city. Over four days we walked, ate, viewed and walked some more; a total of 136km to be exact! This city was both exhausting yet exhilarating. A two block walk east of the apartment was the Flat Iron building, a delightful stop for lunch at the famous Shake Shack (a must do), then down Broadway towards Central Park with a stop at the Magnolia Bakery and the Rockefeller centre where the incredible views of New York are unparalleled. Rain often dampens ideas but a rainy day NY is different, it was that swirling type; it didn’t fall heavy but rather was swept with gusts of wind around the buildings inspiring life ideas and moments to photograph, or maybe because we had no expectations for the day other than to find warm cafes and drink good coffee that it turned out to be one of my favourites. We wandered through the Chelsea markets, given free birthday cake and found ourselves in a French inspired café for good coffee and a nourishing lunch. We strolled the through the tree‐lined streets of the Chelsea, Meatpacking District and West Village where stairs lead to each apartment, the shops are beautiful and the tourists sparse to where we would meet the highline; a re‐purposed train line above the busier streets. Flowers, plants and small trees are woven throughout the concrete filled tracks, contrasted by the city views. By now the mist had covered the city, we couldn’t see the building lights and as dusk fell and the air got cold we ended in an Irish bar near the Empire State. The service by the Irish New Yorkers was far more polite, friendly than the any service we had received by the direct and non‐caring shop assistants scattered throughout the island so far. It was by day three we had realised that you stay up late to immerse in the nightlife, but need to be up early to catch New York sleeping, 4:30am to be exact, we beat the hustle and found ourselves on Brooklyn Bridge with a bunch of New Yorkers quietly enjoying the early the morning light (and perhaps the joint they were smoking). 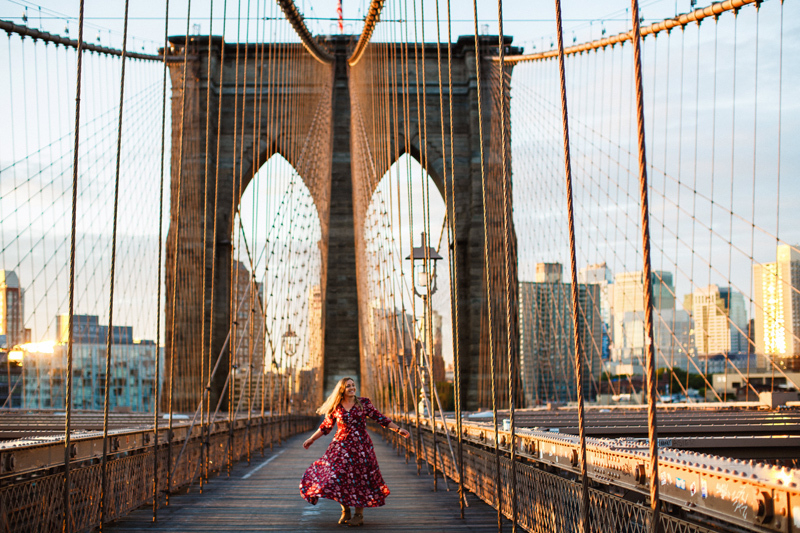 We had already viewed the bridge the day before however it was with many other locals and tourists, we had walked from Dumbo, a secluded area of small cafes, cobbled stone streets and a panoramic view of Manhattan. We made our way to a popular cafe that a friend had recommended, a mimosa for breakfast suited me quite fine. These are just a few little highlights of our days in the big apple and all I can say is New York is a different world, a crazy but beautiful world. * Credit to my awesome husband for his patience and amazing camera work.